Pictured is Kiera Whyte, 15, from Cults Academy. School children took part in a new event this week designed to help them fully understand the threats posed by online predators. Around 25 pupils from Cults, Oldmachar, Harlaw and Turriff academies visited Robert Gordon University in Aberdeen for the Cyber Safe event on Wednesday. 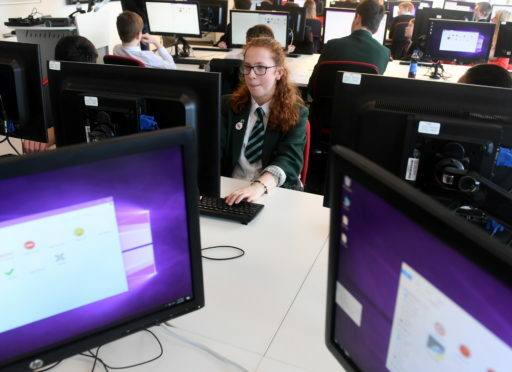 Hosted by Robert Gordon’s University, the project, which is believed to be the first of its kind in Scotland, invited pupils to find out more about a career in online security and learn more about predatory activity. It was organised by child exploitation prevention group Cyber Safe Scotland (SCS) and Skills Development Scotland (SDS). During the session, youngsters were taught how to sharpen their programming skills, and find out more about how best to protect themselves from those who would seek to exploit them. Annabel Turner, CEO of SCS, said the lesson was well-received by the children, who were all from years S2 and S3. She said: “Over the session, the children coded a chat room together, and have been looking within that chat room to look at what types of language are more likely to attract predatory behaviour or attention. “We’re trying to have a real, honest look at how online predators operate, not by focusing on explicit content and details, but with showing these young people the truth about the nature, and size, of the market for sexual material online involving children in Scotland. “The students that we’ve got have reached an age where we feel that being honest with them about the true nature of online predation is really important. Ms Turner said the children had responded positively to the session and organisers were now keen to find out how useful pupils found the information. She added: “It will be wonderful if this approach provides a new way to have this conversation with our children.